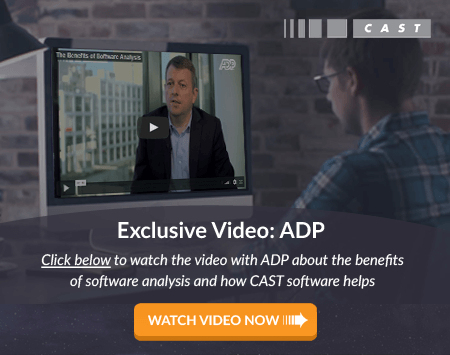 CAST AIP Software Intelligence engine designed to measure software health, size, flaws and generate architectural blueprints of multi-tiered, multi-technology software. Source Code Analysis Tools: What Are Current Testing Methods Missing? Undetected faults in applications are one of the leading causes for implementation and distribution problems experienced by organizations. Is your development team using the right source code analysis tools to detect critical vulnerabilities and make the necessary fixes? Does poor software quality increase maintenance time, heighten security risks, or create more work for your developers? How much technical debt is involved with each development project? Traditional testing does not catch every vulnerability within an application. If dependable source code analysis tools are not being utilized prior to release or implementation, you could be letting future problems slip right through the cracks. What Are Source Code Analysis Tools? Source code vulnerability analysis tools are an automated solution for assessing application code. They can be used to detect flaws or identify improvement areas for creating a higher quality end product. It is an automated form of static analysis that assesses the source code and provides an alternative to manually evaluating each line of code. These solutions do not require test cases or an extensive amount of time, and offer a cost-effective approach to identifying areas of improvement within developed software. If poor quality, missed flaws, or compliance issues are becoming a big problem for your organization, these tools offer a dependable, repeatable benchmarking solution. The base measure is derived from a score generated through the assessment of defined business functions or function points. Each application developed by or for your organization has a set number of functions it should accomplish, which can be used to measure future changes or development goals. CAST Application Intelligence Platform (AIP) uses system-level software analysis to accurately evaluate current codebase quality and detect critical flaws across a multi-tier infrastructure utilizing various technologies. AIP is not limited to a specific language. It is a source code analysis tool for improving development project output or mitigating software risk. Undetected vulnerabilities and insufficient source code cause several problems within an infrastructure including system-wide failures, security breaches, and performance degradation. Don’t let missed flaws or poor quality take down your infrastructure. Click here to learn more about the benefits of using AIP for source code evaluation.